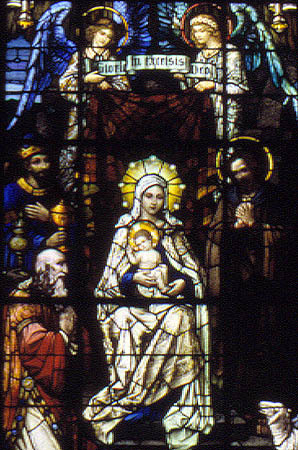 This Nativity Window is one of two great transept windows in the Cathedral of St. Andrew. 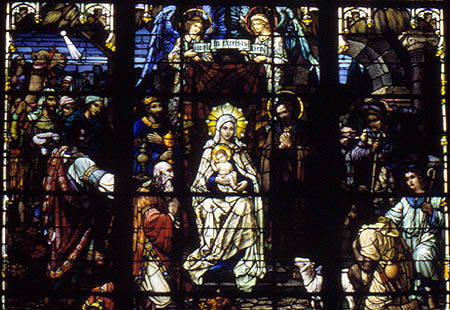 Nearly 26 feet high and 15 feet wide, the window presents all of the characters in the story of the birth of Jesus, as told in the biblical Books of Matthew and Luke. 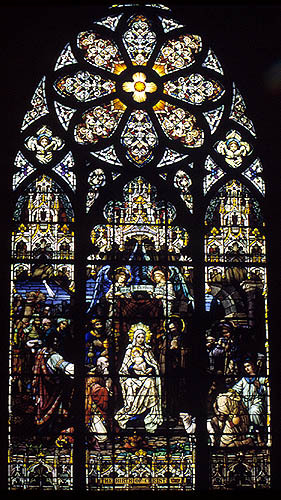 Mary and the infant Jesus are depicted in the center panel. In the left panel, the visiting magi, guided by the star of Bethlehem, arrive bearing gifts, while the right panel shows the shepherds who have come with their flocks. The entire scene is framed by ornate architectural canopies and surmounted by a magnificent rose. To view other windows based on the same theme, visit the Windows of the Month for December 1999, December 1998 and December 1997. Designed by Grand Rapids architect John Grady, the original church was completed in 1876 and named as a cathedral in 1883. After a fire in 1901, reconstruction on a larger scale followed the Gothic Revival plans of Erhard Brielmaier and Sons of Milwaukee. Later additions in 1938, 1961 and 1980-81 added even more space and features. The sanctuary windows were installed between 1912 and 1915. 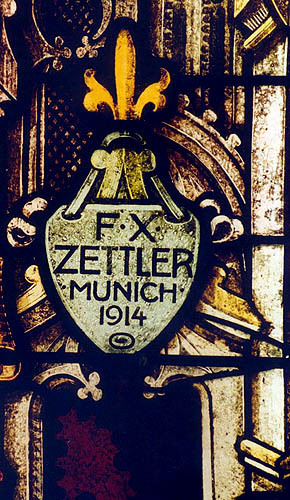 They were made by the Munich studios of F. X. Zettler and Mayer & Co.
Cathedral of St. Andrew of Grand Rapids was registered in the Michigan Stained Glass Census by Thomas R. Bochniak of Grand Rapids. Text by Betty MacDowell, Michigan Stained Glass Census, December , 2002.